Best Evidence Cleaner Software, fix PC errors in 3 Steps! Smart Evidence Cleaner Pro provides a simple tool for cleaning traces left by various applications, such as Internet Explorer, Firefox, and ICQ. Smart Evidence Cleaner Pro doesn't slow system performance when scanning in the background, though the trial version will correct only 10 faulty files.You'll find Smart Evidence Cleaner Pro a good addition to their PC-maintenance regimens. Smart Evidence Cleaner Pro provides you with Registry Backup, System Backup, Favorites Backup and Folder Backup. In addition, the new built-in function of Restore Point enables you to create a system store point so you can recover your system to a previous state if you do not like the changes you have made. This ensures the safety of your system when you run the registry repair process. The Windows Registry is database which records all activities on computer, like system configuration settings, user profiles, programs installation/uninstallation, documents creation, hardware/software operations and PC ports activation. Windows Registry includes information for low-level operating system components. During operation, the registry is constantly referred, while it will be invalid when operation is ended. All in all, Windows registry plays an important role in Windows. Once it becomes cluttered or damaged, computer performance will be sluggish, instable or even fail down. The Windows registry gets accumulated, cluttered and even fragmented due to daily operations on computer, such as incorrect uninstallation of software, corrupted drivers, and dangling shortcuts on desktop. Those orphaned or misplaced registry entries clogs your system gradually day by day, slows down computer performance, leads to system freezing, blue screen, popup errors and even crashes. Smart Evidence Cleaner Pro is the best free registry cleaner to scan windows registry, clean up registry junks, and repair registry errors. It makes sure that Windows Registry is perfect and error free, so as to support your computer running smoothly at peak performance! Smart Evidence Cleaner Pro is the most efficient registry cleaning software to fix registry problems. It works with all Windows Operating Systems and scans Windows Registry quickly with comprehensive analysis. 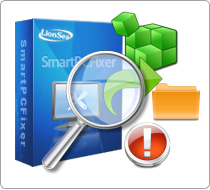 * Smart Evidence Cleaner Pro will fix PC errors in 3 Steps!